For many of us, feelings of deficiency are right around the corner. It doesn’t take much--just hearing of someone else’s accomplishments, being criticized, getting into an argument, making a mistake at work--to make us feel that we are not okay. Beginning to understand how our lives have become ensnared in this trance of unworthiness is our first step toward reconnecting w For many of us, feelings of deficiency are right around the corner. It doesn’t take much--just hearing of someone else’s accomplishments, being criticized, getting into an argument, making a mistake at work--to make us feel that we are not okay. Beginning to understand how our lives have become ensnared in this trance of unworthiness is our first step toward reconnecting with who we really are and what it means to live fully. To ask other readers questions about Radical Acceptance, please sign up. Tim Byrnes Yup I meditate. I liked here association of sensation with mental noise. She has a lot of stuff about the feelings of inadequacy and not being enough.…moreYup I meditate. I liked here association of sensation with mental noise. How do we cope with unbearable pain? We drink, we eat, we smoke. We turn to our iPhones or our Facebook feeds or our video games. We lash out at ourselves or others. But what if instead of searching for external solutions, we learned how to cope with our pain - just by being with it? In her book Radical Acceptance, clinical psychologist and teacher of meditation Tara Brach urges us to do just that: accept ourselves and our pain, so we can treat ourselves with the care and kindness we deserve. Rad How do we cope with unbearable pain? We drink, we eat, we smoke. We turn to our iPhones or our Facebook feeds or our video games. We lash out at ourselves or others. But what if instead of searching for external solutions, we learned how to cope with our pain - just by being with it? 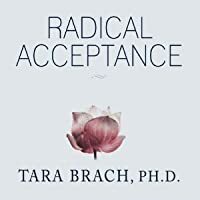 In her book Radical Acceptance, clinical psychologist and teacher of meditation Tara Brach urges us to do just that: accept ourselves and our pain, so we can treat ourselves with the care and kindness we deserve. Radical acceptance may sound flimsy, but Brach makes sure to combat stereotypes about mindfulness and meditation. Radical acceptance does not mean giving up or sinking into passivity. Rather, it means giving ourselves the time and space to pause and to understand each moment, so our actions can reflect our compassion for the world, not just our emotional reactivity. Brach integrates some scientific theory as well as thoughts about medication in her book to enhance its holistic nature. I have struggled with accepting the pain in my life. My eating disorder from years ago served as a way to deal with the pain of my abusive parents. If only I had had the resources to accept and validate my pain, as opposed to fighting it. Even now, I sometimes face concerns about my potential as a psychologist, as a writer. But through radical acceptance, general mindfulness, and Tara Brach's shining example of vulnerability, I know that it is never too late to apply love and tenderness to myself, so I can reclaim my confidence and thrive. Not overly impressive, but a nice and helpful book. Brach writes a treatise on how the integration of Buddhist spirituality and meditative practices (most often based in the Theravadan traditions of vipassana and metta) can partner with western psychotherapy to assist in healing and personal development. Intellectually it is pretty lightweight, which isn’t to say that it doesn’t package and reiterate some helpful ideas in useful ways. My biggest challenge with the book was that I couldn’t really Not overly impressive, but a nice and helpful book. Brach writes a treatise on how the integration of Buddhist spirituality and meditative practices (most often based in the Theravadan traditions of vipassana and metta) can partner with western psychotherapy to assist in healing and personal development. Intellectually it is pretty lightweight, which isn’t to say that it doesn’t package and reiterate some helpful ideas in useful ways. My biggest challenge with the book was that I couldn’t really figure out what she was trying to do: Is it a dharma book? A self-help book? An instructional book to therapists? Not that there can’t be some overlap, but it read to me as being a shallow bit of all of these without going deeply into any of them. Her “cases” are particularly weak as very quickly the recipe for them become clear (a client/patient is stuck or having some kind of intractable problem, works with Brach to integrate the cultivation of mindfulness and compassion, and presto change-o! All is well. It can also be difficult to read some of these without a touch of eye-rolling since in her descriptions of her patients post-practice often includes descriptions where they are “filled with light” “in touch with the great emptiness of awareness” etc (I’m paraphrasing). Her breaking down of specific concepts and applying them (somewhat) systematically is helpful and for most of the book, a breezy read (I found the last few chapters that I was losing a bit of patience), and her inclusion of specific exercises and meditations connected to each concept by chapter is helpful. As, to whatever degree it is, the book has some role as a discussion and instructional guide for practitioner/therapists interested in integrating meditative practices and Buddhist spirituality into their work it would have been extremely helpful, and in my mind helped her cause of this as a serious discussion, if she had spent some focused time and energy on the challenges of doing so, some cases that didn’t go so well, places where the two traditions can seem (and maybe or maybe not be) contradictory or incompatible. Tara Brach leads a weekly meditation class in the metro D.C. area, and I've been to several of them. Her sessions inspire just as much calm and assuredness as this book does. Tara is sort of like the anti-Dr. Phil. Instead of screaming at you about what an idiot you are, Tara puts a comforting arm around you, like an old friend, and using a combination of psychological techniques and a gentle form of Theravada Buddhism, she shows us how we can stop living with doubt, regret, and fear and lead a Tara Brach leads a weekly meditation class in the metro D.C. area, and I've been to several of them. Her sessions inspire just as much calm and assuredness as this book does. Tara is sort of like the anti-Dr. Phil. Instead of screaming at you about what an idiot you are, Tara puts a comforting arm around you, like an old friend, and using a combination of psychological techniques and a gentle form of Theravada Buddhism, she shows us how we can stop living with doubt, regret, and fear and lead a happy, fulfilled life, with a clarity of mind that we can then use to reach out to others who are mired in the same delusions we once were. Me, I'm still working on all of this, but Tara offers you the tools to help you get to a better place, if you're only willing to make the effort. This book offers much more than it first seems to. From introducing the Buddhist practice of mindfulness as applied to difficult experiences, it deepens and opens out into practices of radical compassion for oneself and others - radical lovingkindness. Working & practicing my way through this book very slowly over four months' time has been a tremendous gift. Tara Brach begins by teaching a new way of approaching emotionally intolerable situations - being overwhelmed and practically nonfunct This book offers much more than it first seems to. From introducing the Buddhist practice of mindfulness as applied to difficult experiences, it deepens and opens out into practices of radical compassion for oneself and others - radical lovingkindness. Working & practicing my way through this book very slowly over four months' time has been a tremendous gift. Tara Brach begins by teaching a new way of approaching emotionally intolerable situations - being overwhelmed and practically nonfunctional because of physical manifestations of anxiety, fear, desire, melancholy, depression, anger, embarrassment, as well as by a sense of unworthiness, guilt or shame. She delves into situations of interpersonal conflict, loss, grief, and learning to forgive when forgiveness seems impossible. The practice begins centered in the self and slowly shifts over time to an outward focused, selfless practice of awareness and compassion. It begins by pausing, stepping back, and becoming fully aware of everything that is going on within and around oneself; and then regarding oneself and these experiences gently and without immediate judgment. With clear seeing and "radical acceptance" the situation and my own emotions may still exist but they are no longer completely disabling and in fact it might even be possible to appreciate them. I honestly do not always want to get rid of my sometimes intolerably intense emotions and responses to things because, as an artist, they form the fuel for the power and intensity of my art. But still, it can be hard to live with them in relationships as well as by myself. And - as the practice develops, lo and behold it becomes possible to shift from focus on oneself to focus on others, lovingkindness for others. To learn to live with in peace with myself and others - at least more of the time - is an indescribable blessing. This is also a lovely book, filled with poetry by Rumi, Rilke and others. Tara Brach is quite vulnerable in sharing her personal stories, which may or may not appeal to everyone, but you do not have to have a story line similar to hers to appreciate the teachings. I have tagged many passages and poems to return to. I think the perceptions of this book are directly related to the suffering and innate self hatred that the reader possesses. When the concept of lovingkindness is absolutely foreign to you then this book can save your life. Something I absolutely cherish about this book is kind and gentle repetition. I would read a concept and compartmentalize it as something I either had heard before, already knew, or couldn't possibly work. Then she'd reintroduce the same concept with a case study, a personal I think the perceptions of this book are directly related to the suffering and innate self hatred that the reader possesses. When the concept of lovingkindness is absolutely foreign to you then this book can save your life. Something I absolutely cherish about this book is kind and gentle repetition. I would read a concept and compartmentalize it as something I either had heard before, already knew, or couldn't possibly work. Then she'd reintroduce the same concept with a case study, a personal example or simply restated. Eventually even my stubborn mind was able to accept and hear the message it was trying so hard to avoid and reject. Along those same lines the author seemed to anticipate my mental rejection of the concepts. She would directly confront rationalizations, sarcastic comments or undermining doubts in a way that clearly demonstrated she understood the problems faced by her readers. The most profound impact that this book had was not while I was reading it but later, when I would try and become frustrated at being unable to implement it's teachings. I would chastise myself or the book or ideas and suddenly become aware that I was falling into a pattern explicitly detailed here and given instructions on how to unravel the habits I had become so used to. One sometimes runs into folks who are suspicious of Buddhism and particularly of the capacity of westerners to find solace in an allegedly Buddhist perspective. I am not a Buddhist, but have found a lot of value in meditation--and in the ethical viewpoint roughly associated with Buddhist practice. So if the discussion comes to exchanging book titles this is the one I recommend as an introduction to what I'll roughly call a Buddhist approach to suffering. There are better books on meditation. There are better books on the Precepts--the founding concerns of Buddhist ethical life. There are better books on...Buddhist monastic life, lay life, activism, spirituality, sexuality, relation to psychotherapy, the tradition's kooks and heroes and Americanization. But I don't think there's a better-voiced introductory book on the practical value of cultivating a Buddhist frame of mind in relation to suffering and what she calls "the trances" of everyday life. The first time an American from what is most likely a Christian background picks up a Buddhisty book it's likely to be pretty scary. Tara Brach seems to get that, and to address such seekers in an inviting and heart-opening way. One of the things I like about this book is the many sources it draws on. It is personal, telling, for example, of joining an ashram and having a falling out with its leader, of a divorce, of difficulties in raising her son. It draws on her professional work, relating stories of exchanges that, as a psychotherapist, she has had with her clients. And most of all it is literary, skillfully so. She retells and interprets stories from the tradition, as well as anecdotes from contemporary American life, all to the end of introducing the outlines of a kind of consciousness she calls "Radical Acceptance." So I don't usually read self-help books. At all. I kinda hate them. And I don't usually read hippy dippy Buddhist stuff either, because I get too scoffy. When I started this one, I almost didn't go past the first chapter, because it was not really resonating with me at all. And parts of the book (like the closing chapter on discovering our true essence and realizing we are nothing but awareness..... super hippy dippy) totally fell flat. But there were a few key sections, and really the overarchi So I don't usually read self-help books. At all. I kinda hate them. And I don't usually read hippy dippy Buddhist stuff either, because I get too scoffy. But there were a few key sections, and really the overarching concept, that were just so useful and important and applicable. I liked a lot how she used real life anecdotes about people applying these concepts to their own challenges. I'm also on a somewhat hippy-dippy "journey" in general to reshape/revitalize my spirituality which I thought had been permanently killed and buried, and which I'm really enjoying being able to connect with in new ways. And reading about different spiritual experiences people have with these meditation techniques, and feeling the familiarity of it all from when I used to pray on my knees to Jesus, really reawakened a desire to use that part of myself. about recognizing, with compassion, your own weaknesses and in the end, finding room to accept them and treat them with love; in effect, healing yourself. It's like going over to a suffering plant in a garden and tending to it with care, feeding the soil, doing away with pests, giving it compost, sunlight, water; is, metaphorically, how this book suggests we deal with our own fragile, deeply human lives -- that by encouraging our friends and families to take care of themselves the same way, we c about recognizing, with compassion, your own weaknesses and in the end, finding room to accept them and treat them with love; in effect, healing yourself. A wonderful book on accepting one's self and life exactly as they are (thus creating the possibility of change). Brach provides many wonderful meditations which I've already begun using and find very helpful. The writing is clear and warm and easy to follow. It would be a fast read if there weren't so much to pay attention to. I was also slowed up because I stopped to use her different suggestions. I also enjoyed her use of the examples of other people and their struggles (as well as their succes A wonderful book on accepting one's self and life exactly as they are (thus creating the possibility of change). Brach provides many wonderful meditations which I've already begun using and find very helpful. I also enjoyed her use of the examples of other people and their struggles (as well as their successes) and her sharing of her own personal experiences. They created a personal connection to her work that otherwise might have felt more distant and abstract. Her examples both drew me in emotionally and provided more understanding of how to use her suggestions. I have tried twice to read the Power of Now, and could never quite grasp what all the fuss was about. This book, Radical Acceptance, delivered the insights that I was supposed to get from the other book. It is basically talking about the same subjects, but Tara Brach brings a humanity to her approach that is sadly missing in Power of Now. 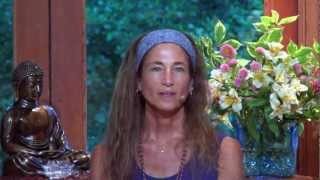 She has been persuing a spiritual path for many years and speaks with knowledge and compasison. Yet, she admits that when she is continuously approached by a d I have tried twice to read the Power of Now, and could never quite grasp what all the fuss was about. This book, Radical Acceptance, delivered the insights that I was supposed to get from the other book. It is basically talking about the same subjects, but Tara Brach brings a humanity to her approach that is sadly missing in Power of Now. 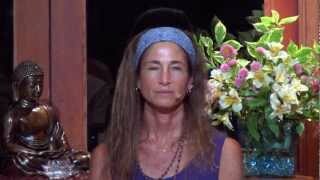 She has been persuing a spiritual path for many years and speaks with knowledge and compasison. Yet, she admits that when she is continuously approached by a difficult student or her son misses the bus and has to be rushed to school, she sometimes gets caught up in the anxieties and difficulties of just living life. Again and again, it is mentioned that she has to keep reminding herself of her spirituality. I love that humanness. It makes me feel that I can do this, too. After all, who has five months to sit on a park bench and contemplate life? Most of us have to continue to deal with life, regardless of what spiritual path we are on. Tara Brach shows one way that you can do both. If I pause and accept any more radically than I have come to realize I do, my husband will divorce me and my kids will starve. I tried to read this a second time and while it does have some nice points, it's nothing new to anyone who has ever read a book (or a dozen!) on mindfulness, Buddhism, etc. Radical acceptance was suggested to me by my therapist, and since I’ve started listening to the audiobook, I’ve gone back to parts of it over and over. It's been enlightening more than any other self-help book I’ve read (which are not many, to be fair). I'm not particularly spiritual, or good at sitting still and meditating. But, since I've been listening to this book, I've made more efforts throughout the day to hold a caring thought to my body and myself, especially in the moments in which I d Radical acceptance was suggested to me by my therapist, and since I’ve started listening to the audiobook, I’ve gone back to parts of it over and over. It's been enlightening more than any other self-help book I’ve read (which are not many, to be fair). I'm not particularly spiritual, or good at sitting still and meditating. But, since I've been listening to this book, I've made more efforts throughout the day to hold a caring thought to my body and myself, especially in the moments in which I don't feel great about things. If it hasn't opened the gates of happiness, it definitely has helped in making me realize I spend way too much time running away from negative thoughts, and trying to distract myself with ephemeral things, rather than facing them. The main message of the book is quite simple, but extremely important: many people in modern society, if not almost everyone, deep down feels a feeling of unworthiness, that we’re not enough to be loved the way we are. We keep attacking ourselves, and criticizing ourselves, treating ourselves with little kindness. We’re trapped in feelings of shame and guilt: we do not deserve to be happy, but all we look for is to be loved, to feel whole and happy. Here is were radical acceptance comes to play: instead of running away from bad feelings, one has to look them in the eyes, to acknowledge them, to feel them. Rather than running away from the pain, one should hold its hands, and eventually she’ll go away on its own. Meeting sadness or pain as a part of life and existence, the way of the Buddha, rather than something to be run away form. A way in which one can hold on to this is through a body scan: once an unpleasant feeling starts to arise in the body, in the stomach, in the head or chest, that can be used as an anchor to understand what we’re feeling. Once the suffering has been detected and acknowledged, the stage of compassion can initiate: instead of shoving the pain away, instead of feeling ashamed for suffering, the pain can be soothed by a deep compassion for oneself, a taking care of your own wounds. We all commit mistakes, we all feel shame and guilt. But the first stage towards finding others’ forgiveness is accepting the pain, and feeling compassion for oneself. It’s important to not confuse the acceptance of pain with playing victim, being resigned to suffer and giving in. That is not what radical acceptance should be about, according to TB: radical acceptance is a process that frees the mind from the anxieties, confusion and restlessness that negative emotions may arise, and in this way it creates space for the mind to see clearly, to engage in more thoughtful actions. I picked up this book because it seemed like a more mindful exploration of Self Compassion, and the prologue certainly leads one to believe that this is the case. She speaks of her own struggles with the behaviors that keep us all trapped in an endless loop of trying to prove ourselves good enough to a critic (ourselves) that will never approve. And she offers meditation- true Buddhist meditation practices akin to what I imagine are used in ashrams and monasteries across the world- as the path t I picked up this book because it seemed like a more mindful exploration of Self Compassion, and the prologue certainly leads one to believe that this is the case. She speaks of her own struggles with the behaviors that keep us all trapped in an endless loop of trying to prove ourselves good enough to a critic (ourselves) that will never approve. And she offers meditation- true Buddhist meditation practices akin to what I imagine are used in ashrams and monasteries across the world- as the path to freedom. And that's where I was most surprised with this book. I was familiar with the case studies- I'm a therapist by trade so examples of people struggling with addictions, traumatic backgrounds, and deep emotional battles were very comfortable territory for me. I connected easily with their struggles, the thoughts and feelings that cause them, and the difficulty they face in changing them. But the practices of dzogchen awareness and tonglen compassion were new to me and her descriptions of how these practices have changed the way she relates to her own life have awakened a new passion to explore this world of traditions that I've only scratched the surface of before. I suppose the title give is away- the heart of a Buddha is written right there on the cover. But I honestly wasn't expecting to be as absorbed and turned on as I was. I now recognize that basic mindfulness in the service of self compassion isn't enough. It's a good start, certainly, and I think Kristin Neff was a good introduction before diving deeper with this book. But now I'm hooked. I loved this book! I was taking DBT weekly group meetings where we practiced awareness. I recently stopped going as I "graduated." However, I soon realized I began to lack the precious skills I had learned. I began to read this at a slow pace, thinking that every so often I could refresh my memory and pick up my slack in that department. It helped. One reason I wanted to read this was because there are many parts in my life which I have difficulty accepting. I have already been working on accept I loved this book! I was taking DBT weekly group meetings where we practiced awareness. I recently stopped going as I "graduated." However, I soon realized I began to lack the precious skills I had learned. I began to read this at a slow pace, thinking that every so often I could refresh my memory and pick up my slack in that department. It helped. This is a somewhat a difficult read. I wanted to try and remember as much as I could, so I took time reading each word, not skimming over the sentence like I do in some other books. Sometimes, sections were very deep and I had to reread the part over again or take a moment to think about what I just read (which I loved!). Full marks for the gist and low marks for the execution. A little too self-helpy and over-written, yet the idea of bringing radical acceptance/compassion to ourselves and others is pretty much the only hope for emotional sanity in this world. But for content, economy, and grace, I'm finding Ezra Bayda's "Being Zen" to be a huge improvement. Let's just say Bayda's book is going on my shelves when I'm done. Brach's book is going to half.com. I disliked this book enough to stop reading it with 75 pages left to go. No compelling reason to finish it. The meditations were nice, if someone were reading them...but you can't read it and meditate at the same time. I found the book to be very repetitive and somewhat annoying. These days, it feels like emotional reasoning and unchecked emotional responses are endorsed and increasingly seen as the default or "right" way of behaving. We are encouraged to indulge in whatever we want and feel as being our right and the best way of being in the world. I can't help but think that's not right -- and all the books I have read about leadership, emotional development, connecting with people and meditation recommend a higher level of self awareness and just taking a pause before These days, it feels like emotional reasoning and unchecked emotional responses are endorsed and increasingly seen as the default or "right" way of behaving. We are encouraged to indulge in whatever we want and feel as being our right and the best way of being in the world. I can't help but think that's not right -- and all the books I have read about leadership, emotional development, connecting with people and meditation recommend a higher level of self awareness and just taking a pause before reacting emotionally. Tara Brach has a very excellent writing style -- this book isn't emotionally or intellectually heavy, and there is some repetition but it's all done with very clearly written and engaging examples from cases studies of actual people and mythology. I especially appreciate the recurring theme of "Mara" as the demon of fear/shame. Step into that fear and accept and experience it -- and you'll find that you defuse the power of that as soon as you choose to do so (vs giving it power by running and hiding from it). The key points for me in this book are of mindfulness -- just being present, learning to expand your awareness to feel greater compassion for others and yourself, appreciating the current experience and being open to more choices about what is available. And - the illusion of "self" - we all share the same desires and fears. The basic orientation of Buddhist belief is that all people want to feel loved and belong -- I wish I could believe that is true of all people, but there are so many examples in my life that run counter to that belief. One of the most powerful stories is shared early in the book -- about a woman who is visiting her dying elderly mother: "One morning before dawn, she suddenly opened her eyes and looked clearly and intently at her daughter. “You know,” she whispered softly, “all my life I thought something was wrong with me.” Shaking her head slightly, as if to say, “What a waste,” she closed her eyes and drifted back into a coma. Several hours later she passed away." This is the struggle -- all people feel we are doing it wrong, something is wrong with us and we make ourselves feel separate from others. Especially in our culture - and not helped by social media - we are surrounded by messages that we're all doing it wrong, rather than inspiring us to connect, it leaves us feeling incomplete - making our culture the strongest practitioner of "divide and conquer." Really a good book - I may buy a paperback copy as a keeper for an annual re-read! Radical Acceptance is a powerful, transformative book. Tara Brach combines insight (or mindfulness/awareness) meditation practice with psychotherapy to paint a picture of how we can reach greater freedom, equanimity, self-compassion, and compassion for others through acknowledging and accepting all of our emotions and thoughts. Acceptance of emotions, feelings, thoughts, and sensations does not equate to accepting all behaviors and actions. 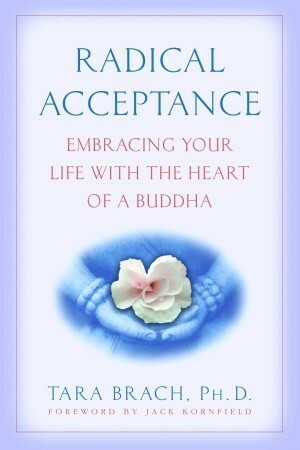 Rather, the fundamental insight is that if an emotion o Radical Acceptance is a powerful, transformative book. Tara Brach combines insight (or mindfulness/awareness) meditation practice with psychotherapy to paint a picture of how we can reach greater freedom, equanimity, self-compassion, and compassion for others through acknowledging and accepting all of our emotions and thoughts. Acceptance of emotions, feelings, thoughts, and sensations does not equate to accepting all behaviors and actions. Rather, the fundamental insight is that if an emotion or thought is happening, there is great freedom to be found in allowing it to happen and feeling it fully, rather than trying to ignore it or push it away -- pushing away painful emotions actually cause us more pain in the long run. This book is essentially a recipe for learning how to do therapy on yourself. I have worked with a therapist for awhile but in reading this book, developing a daily meditation practice, and working with Tara's exercises, I have developed a greater ability to hold space for myself and allow myself to work through emotions without needing another person present helping me. The power of this work is truly amazing to me! There is a bias in the book towards working with difficult, challenging emotions and past traumas. Some of the examples did not resonate strongly with me because I do not have a lot of trauma to work through, but rather just the day-to-day stresses of living and recognition of patterns I have fallen into that cause me suffering. However, I found that I was able to take her words and examples and translate them well to my own experiences. If you are interested in developing a daily mindfulness practice but not quite ready to take on emotions head-on, then another book may be a better starting point (such as Wherever You Go, There You Are, by Jon Kabat-Zinn, which I'm partway through and finding to be a great, practical guide). However, I feel that true mindfulness does involve facing, accepting, and feeling your emotions fully and so it is unavoidable that you will start encountering the types of things that Tara addresses. This book hit home on so many issues for me. Kindness and compassion, for others, but also for ourselves. This is not a book for someone who is not open to Eastern thought. If you allow yourself to be open to it though, it will open your mind and heart. On page 175, where the author talks about "taking refuge in the Buddha," she talks about when the Buddha faces fear with his full intention, and realizes that he is actually fearless. Difficult to understand...facing fear is to see the reality of it, making it less fearful. She compares this to people who are "devotional by nature who pray to Christ or the Divine Mother; these people take refuge in a being or presence that cares about our suffering." The most beautiful thing I took away from this chapter is the idea of taking "refuge in the Beloved." This is such a comforting thought, reminding me of the great love of God. This book is really helping me during my current life transition. Everyone should have a copy of this book whether they think they need it or not. Seriously. Bought a copy for my Mom for Christmas and she says it is fantastic. There were days I felt like a loser for being divorced and unemployed but this book taught me to change that negative thinking and to love and accept myself so I can fully love others and improve my life. When I first tried to read this book, it did not touch me and I was highly critical of it - even though I did not finish it. I am now coming back to it after many years and I find it is breaking my heart open in many ways. I am recognizing that my resistance has probably been about needing this work very much. This time, I plan to get all the way through! The first few chapters and last few chapters are excellent, with what felt to me like valuable wisdom and interesting/helpful anecdotes. The middle felt formulaic and unrealistic. But the good outweighs the bad and I'll be keeping this one around to return to its teachings on compassion for self and others.